I immediately squeaked like a little girl, “Naaakkkkkkk”. Hehe..
Ok, I’m not so into Prince William (anymore.. since he loss his hair!) but there’s something about The Duchess herself. She is just nice to look at.. In real life, both of them are so tall.. William probably more than 6ft, coz he’s taller than my husband and Kate is slightly shorter than him..and that is super tall compared to average Malaysians. And Kate is so skinny, “Hello woman, put some weight lar.. how to get pregnant? ?” and that spells J.E.A.L.O.U.S!! Here’s me behaving like a 12 year old kid seeing her favorite popstar.. And thanks to my husband who is so supportive memalukan diri to take my picture. There’s Kate Middleton talking to our Queen and in front of her in her husband.. Prince William!! Posted on September 13, 2012 by Dr Halina Mohd YunosPosted in WhateverTagged whatever. Next Next post: The New Generations..
wahhhhh….. untung dr.halina.. dpt jumpa Prince William & Kate Middleton…..
tp bila baca yg dr dh jumpa td n u describes just the way that i wud act feel also..rasa mcm i tumpang jumpa jgk dah…puas ati la jugak kan…haha..u r always funny!! kate is terribly skinny but so cantekk..wargh! i feel same way..ahaha even x dpt jumpa tpi look at this pic i rasa mcm dekat je dgn kate..ahaha..thanks Dr Halina..
Hahha,,just laugh with my all sibling when we read yr blog in your “nada” baca skali tu! When u type “!!!!! !” then our nada is change like “!!!! !” also, u know rite dr?! ;) , so cuteeeee la dr halina ni!!!! But really upset, yr blog always shorter than we expect, bace sket scroll byk kli kat bwh, eh habis da ke entry ni.. Always keciwa n mbawa hati yg lara.! Hehe. totally agree withu nasuha..i wish la byk skit entry untk dibaca ..sbb dri situ i get a lot of the information , knowledge, been sharing wht we feel . hehehe,,klaka la “Here’s me behaving like a 12 year old kid seeing her favorite popstar”..ada la sikit2..kikiki.. Both of them are so sweet. They are meant for each other. Lucky you!!! Fab! What was on the menu for dinner? ” And thanks to my husband who is so supportive memalukan diri to take my picture.” Lol, tahniah Dr.SMS. haha! Tingggiiinyerrrrr both of them and i am so jelesssssssss okeh! Jeles jeles jeles. Igt time wedding dorg, sggp ponteng keje sbb nk tgk live!! Dr . Suka keletah u dlm usaha nk bergmbar dgn pasangan tersebut. . .thnx juga kat DSMS yg sporting. . .. .
Uish! Mummy Akmar pon nak jugakkkkkkkkk! Hehehe… Beruntung nya u Doc! Im star-strucked jugaks.. just by looking this picture.. if jumpe depan2, boleh pengsan kot? 200% agree with Maryam statement…. 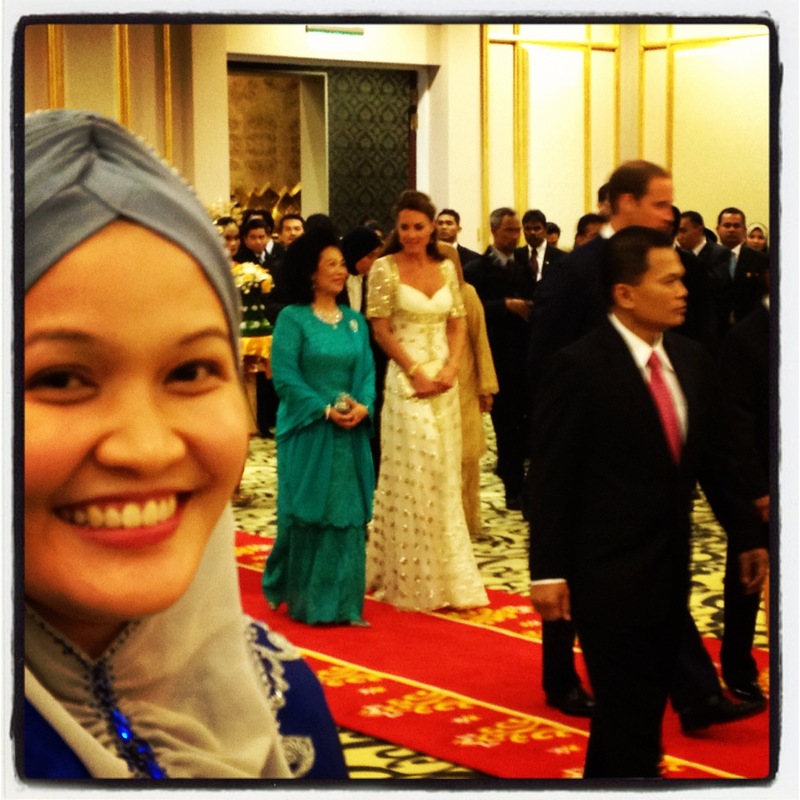 Teruja tgk Kate & William..tapi..tgk gambar Dr Halina..dan baca blog lagi best…Tak dinafikan Kate cantik..tapi apa kurangnya Dr Halina? setuju dengan dr sheikh!!!! all girls dream tue!! marry a prince and being a princess!!! If I were in your shoes, I would have done that too. wheeeee!!! hehehehe. *excited mode* I totally agree that the both Will & Kate are taller than the average Asians. The only fact that Will’s loss hair.. i guess he inherited frm the royal family. I still remember I got an invitation & have the chance to meet Will’s uncle Prince Andrew personally during his visit to SG 11 years back . Got the chance to capture few photos with him. :)) Prince Andrew himself has loss hair. lol!! Mcm mana i tahu? During the photo session and I was standing behind Prince Andrew who was sitting down realising that the loss hair at the same spot similar to Will. hahahahah.. Cute ar Dr. Halina. Kan da kena kantoi dgn yr hubby. Anyway it’s has always been every woman’s dream to live like a ‘ tai-tai’ in the ivory tower kan. Setuju tak? what do you think of the leaked french photos of kate? everyone does that.. except that she’s married to a prince, thats why ppl make a big deal out of it. let her be.. she will never get away from those paparazzi. poor kate cant even enjoy her married life with husband..
Assalamualaikum. Alhamdulillah dah cuba memakai tudung. Semua terus memperbaiki diri dgn menutup aurat dgn cara Islam yg sebenar. InsyaAllah. wish i can see them too! and yes, same good reason..yg kantoi tu lah minat kate sangat but kurang minat with william afta kehilangan rambutnya tu..hahaha..
ahhahha… u adore kate…i adore u!!! :)..ahahhahah…we same feel!! :)…can you fel that!